A dirty, yellow microwave isn't pleasant to confront with your lunch or coffee ready to pop in to enjoy. 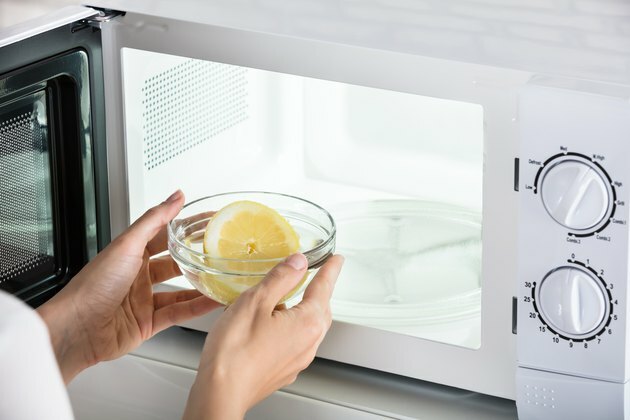 If you microwave fish and can't get rid of the smell or have a yellow stain in the microwave, you can bring the useful small kitchen appliance back to a beautiful condition with a couple of tricks that you can complete in a few hot seconds. Bags of popcorn that have spent a few spins too long in the microwave can cause yellow stains to form on the inside of the microwave oven. Oils and mustards or other sauces that contain turmeric can also create yellow stains on the porous plastic material of the microwave quickly. To remove them easily, slice up one fat lemon and place it in a microwaveable bowl. Add a tablespoon of baking soda and put it in the microwave. Cook on high for two minutes. Let it sit for a few minutes to release steam into the oven cavity. Scrub down the walls and ceiling of the microwave. A swipe of vinegar can also remove yellow stains that stubbornly stick to the inside of the microwave oven. Those brownish blazes or spots that show up on the sides and ceiling of the microwave are signs of hard use. If the metal grate isn't fit into the clips of the microwave properly, it may brush against the sides of the microwave and cause sparks that can leave behind scorch marks. Don't ever try to use a rack that didn't come with your microwave. The rack in your oven is tuned to that particular appliance and shouldn't spark unless it's not fit into its clips correctly. Once the scorch marks have been made, clean them off as soon as possible. Make a paste of baking soda and vinegar or lemon juice and scrub the marks until they disappear. This may take a few attempts if the scorch marks are serious. Use gentle abrasives and household cleaning agents before you go for the harsher chemicals that can cause issues with the food-friendly appliance. Baking soda and lemon juice work wonders in maintaining a clean microwave before it collects yellow stains from sauces, burritos and breakfast. If you have difficult stains, you can make a paste of baking soda and vinegar and leave it on the stain in a thick layer for 20 minutes to pull the yellow stain from the plastic interior of the microwave.